Google Has Spoken: The Age of Mobile IS Here - Cyber-Construction, Inc.
Over the past few days, Google has been sending email notifications to webmaster users regarding sites that are not mobile friendly. The emails come with a subject that reads, “Fix mobile usability issues”, and then the body of the email goes into details to explain to the webmasters that their websites have a high number of mobile errors on their pages. The primary aim of these emails is to remind the webmasters that their websites are not mobile friendly and thus will not rank well in mobile search. Mobile optimization, and the surge of apps for ease of use in our daily lives, has grown like the beanstalk Jack just planted. Mobile based browsing has surpassed desktop browsing as people are increasingly making searches on the go. This, of course, has given rise to a new arena of Mobile SEO. As a prime example, look at your daily activity. You check your email, look for restaurants, movie theaters, check for driving directions and snap photos of your dogs or your marionette collection. More importantly, you are now browsing sites online while you’re waiting at your doctor’s office–who is late, AGAIN–to see if you can buy those new anti-fog swimming goggles you recently heard about. 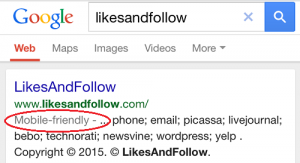 If you’ve noticed your search results recently, Google has been labeling websites for being mobile friendly. There will soon be rich rewards in the form of higher ranking and site traffic for those websites who are mobile-friendly. There are various advantages of optimizing websites for mobile. Based on my example above, anyone who sells products or services online needs to cater to those who are on the go so they can buy those products and services while they’re waiting at the doctor’s office. Did you just receive a check in the mail and need to deposit it? Just use your bank’s app to upload the check and save yourself a trip. The main advantage for mobile optimization is that your website becomes accessible to anyone who has a smart phone. There is no potential customer excluded from viewing uploaded content. This results in greater customer reach. Mobile optimized websites are also useful in boosting search traffic to conventional websites and the respective marketer’s social media page. It’s very easy for customers to get onto a company website through a mobile phone supported site, which acts as the launching pad for marketing on the web. The age of mobile is no longer on its way. It’s officially here. Cyber-Construction can easily create a mobile website that spans all device types, which will provide your customers with a consistent and friendly experience no matter what medium they are using. It’s time to become mobile. Give Cyber-Construction a call for a proposal at (888)852-6587.